Humboldt Bay's most common cormorant is the double-crested, shown in this fine photograph by Leslie Scopes Anderson, used with permission. "Criticism flows off him like water off a duck's back," we say, referring to someone who is incapable of hearing feedback. Water does indeed flow readily from the oily feathers of a duck, and not just off its back. Its breast feathers are equally water resistant, so most ducks can happily paddle around in cold water for hours on end, as if wearing a well-tailored drysuit -- their preen oil keeps the feathers from drying out and becoming brittle. Being bottom feeders, ducks have to lose buoyancy in order to dive. They do this by squeezing air out of their internal air sacs, which are inflated when they're on the surface. Not so cormorants. Unlike ducks (mergansers are the exception), a cormorant survives mainly on fish and eels, spending several minutes at a time swimming underwater -- some have been recorded diving more than 120 feet deep. They manage this by essentially wearing a wetsuit over a drysuit: In addition to their inner duck-like plumage, cormorants have an outer layer of wettable feathers. 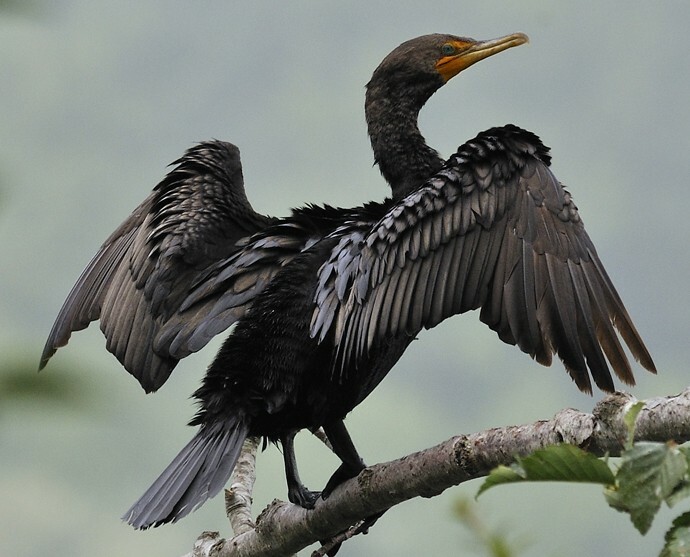 Although researchers disagree on the details, the consensus is that cormorants' outer layer of feathers is less oily and more permeable than their inner, duck-like feathers. When a cormorant dives, it achieves "neutral buoyancy" (where its density is equal to the water it's swimming in) by trapping water in its outer layer of feathers. This trick allows it to swim like a penguin and dive like a seal -- and catch fish and eels. One researcher compared the swimming abilities of cormorants to an airplane in flight. According to Zeev Arad of the Technion-Israel Institute of Technology, "Similar to the way an airplane creates uplift in order to keep it in the air, cormorants create negative lift, which enables them to dive. In effect, cormorants have found the golden mean between penguins and ducks. The penguin gave up on flight in favor of diving. The duck flies well but dives poorly. The cormorant excels at both." The only problem with this system, of course, is that a cormorant's feathers need to be dried out regularly -- it's hard to fly with wet plumage, not to mention the danger of hypothermia. Which is why we often see them perched on old pilings with their wings outstretched: they're drying off after diving for dinner in the cold water of the Bay. Barry Evans (barryevans9@yahoo.com) admires cormorants in the Bay from within the waterproof skin of his kayak.